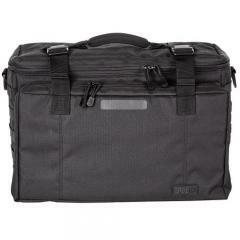 The 511 Tactical Wingman Patrol Bag is a lightweight messenger bag that doubles as a car seat organizer. When secured to the front seat, it folds out to reveal a pair of Back-Up Belt System-compatible web platforms, as well as an organizer panel and a write bar for filling out paperwork. As a messenger bag, it includes a large main compartment with an adjustable divider for organization. It is made from tough 600 denier nylon, combining durability and wear resistance with light weight, and includes a padded and adjustable shoulder strap for comfortable portability. Best patrol bag Lots of room and pockets. Best bag I have seen so far. It's a great quality bag and worth the price.